RHS Chelsea a first for the Suffolk based business Wooden Garden Obelisk a family business owned and run by Colin and Kay Thompson. The business started from home 3 years ago has gone from strength to strength and Colin & Kay putting the emphasis on providing a high quality product and service to all clients that includes personally delivering all the obelisks. Colin & Kay were delighted to be given a place at this years RHS Chelsea flower show, and received many positive comments about their obelisks with many satisfied customers ( who they were delighted to meet again) coming along to say how pleased they were with their obelisks and the service from them. Colin & Kay said that the whole Chelsea experience which is very exciting, along with planning the show stand began late December last year and was only completed a few days before the show, and that seeing the stand complete was a great accomplishment after months of planning it all Wooden Garden Obelisk hand make bespoke garden obelisks in the following woods English Oak, Western Red Cedar as well as painted ones using treated timber which can be finished in any colour of the clients choice from the exterior paint ranges from Farrow & Ball, Little Green or Cuprinol Garden Shades. Colin & Kay work closely with many Garden designers who choose their obelisks for clients gardens, and this year Colin & Kay are delighted to have 3 of their obelisks going into a show garden at this years RHS Hampton Court flower show. 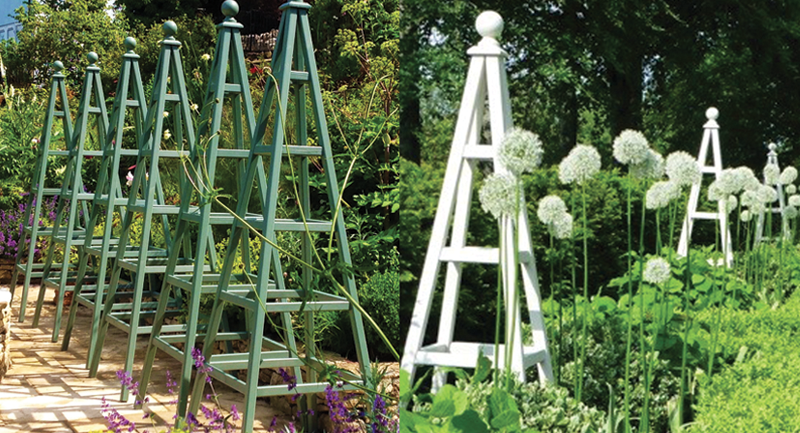 Wooden Garden Obelisks will also be exhibiting at this years Hampton Court Show again for the second year running with a selection of their garden obelisks on show on their stand. Colin said we set out to give our clients that now include many high profile establishments such as the Belfry Golf Resort, Highclere Castle ( Home to Downton Abbey) Duchy Nurseries Lostwithiel to name a few, a quality product & service that would make the whole experience from start to finish one they would remember in all the right ways. All our wood comes from sustainable, traceable managed sources, and we take great pride in offering our clients obelisks that are of a high quality, hand made and will enhance their gardens.